Global photovoltaic (PV) installations will rise this year in a continuing pattern of solid growth, but the industry will nonetheless suffer a decline in overall revenue due to lower volume growth and decreasing system prices, according to an IHS Solar white paper from information and analytics provider IHS (NYSE: IHS). 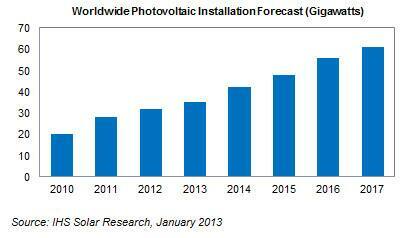 PV installations are projected to reach 35 gigawatts (GW) this year, up from 32 GW in 2012. In comparison, industry revenue—measured as the system price multiplied by total gigawatts installed—will retreat to an estimated $75 billion, down from $77 billion last year, and exhibiting an even steeper fall from the market’s peak revenue of $94 billion in 2011. Along with slightly diminished prospects this year, an equally imposing problem for solar companies will be the rapid globalization of the industry, Sharma noted. Europe accounted for more than 80 percent of solar demand in 2010, but its share is on the wane—contracting to 53 percent in 2012, and forecast to slide further this year to 39 percent. Meanwhile, Asia is on track to replace Europe as the world’s largest source of solar installations moving forward. After years as the world’s top solar market, Germany will fall to third place in 2013, behind China and the United States. Japan and Italy follow in fourth and fifth, respectively. More important than the change in ranking is the geographic fragmentation expected to escalate this year. Although the Top 5 accounted for nearly 75 percent of total solar demand in 2012, the group’s combined share this year will drop to 65 percent. Midsized markets, like South Africa and Romania, are anticipated to gain increasing importance on the world solar stage, even with installations of just a few hundred megawatts per year that will end up eating into the share of the majors. Despite the resulting market fragmentation, the good news is that more stability will result for an industry swinging perpetually from bust to boom, Sharma said. In particular, the policies emanating from a single government will now have less of a monolithic impact on the overall global solar market. Stability comes at a price, however, according to Sharma. A steadier market also means more intense challenges will be in store for solar companies, as firms are forced to undertake actions large and small in order to globalize their business. Such measures could entail setting up new sales and service networks, compliance with local requirements and grid codes, and navigating past the “quick-hit” markets that are present one year and gone the next. Sunnier prospects are in store on the whole starting next year, when solar industry revenue expands in the double digits from 2014 to 2016. Revenue will then soar past the high watermark of 2011, climbing to $115 billion by 2016. For more details on this topic, please see the IHS Solar White Paper entitled: “The Global Solar Power Industry for 2013: Predictions and Prospects for the Year Ahead."